Langtang Helicopter Tour will take you among the high Himalayas region of Nepal from Kathmandu in just a short period of time. You can discover the wonderful white giant mountain and the religious Buddhist Monastery at Kyanjin Gompa. The tour offers you the marvelous opportunity to views breathtaking snow-capped mountains like Ganesh Himal, Mt. Langtang, Lakpa Dorje, Naya Kanga, Yala Peak, as well as Gaurishankar and Annapurna Massif. 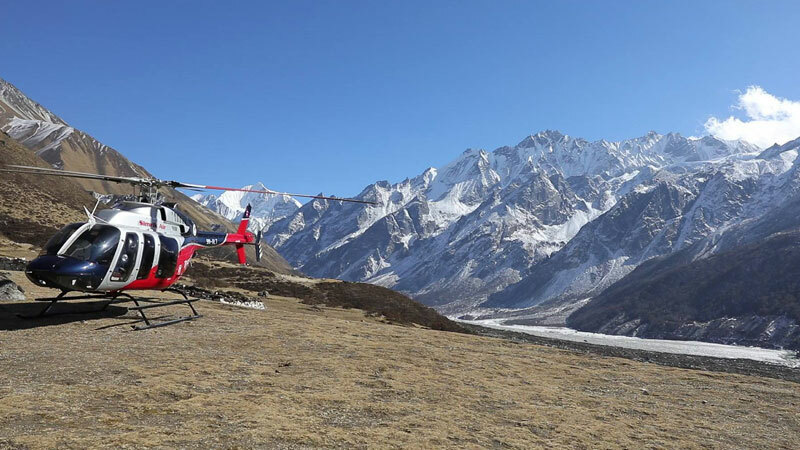 An hour and a half Langtang Helicopter Tour starts chasing Langtang Mountains to the north of Kathmandu Valley where you will be passing through lots of high Himalayan villages and Gosaikunda Lake as well. The helicopter will be landed near Kyanjin Gompa and a maximum of half-hour time will be granted to explore the beautiful scenery and other attractions. Afterwards, fly back to Kathmandu and transfer back to your hotel. You will be received by our airport representative then he will be assisting you to transfer to your hotel. Meet guide and a brief introduction to the whole program. After short rest proceed to visit Pashupatinath Temple. Back to hotel and rest. Overnight at Kathmandu. Day 02: Fly to Langtang by Helicopter. Early morning our guide will pick you up from your hotel. Then, transfer to the Kathmandu Domestic Airport where our helicopter will be waiting for us. Complete the formalities and fly from Kathmandu to Langtang. The helicopter will be landed near Kyanjin Gompa. Half hour time is provided to visit the nearby attraction then back to the helipad and fly back to Kathmandu. Arrival then transfers to your hotel and free time. Morning a short visit to the monkey temple called Swoyambhunath Temple. One can have a birds-eye view of Kathmandu valley from the top of Swoyambhunath. Explore the Buddhist temples and back to the hotel. You will have free time until 12 noon. After that check out from the hotel and transfer to the airport. It's time to say goodbye and bring a wonderful memory back to your home. Muktinath Helicopter Tour finished here! Pashupatinath Temple visit by private vehicle. Kathmandu to Langtang by chartered helicopter. Twin bed sharing hotel accommodation. Swoymabunath visit by private vehicle. Tour will be escorted by an English speaking guide. Bar Bills like mineral water, beer, whiskey etc. Wants some modification on Langtang Helicopter Tour itinerary? contact us to customize it.